Finding a cheap entertainment center doesn’t have to be difficult. An entertainment center is a piece of furniture designed to provide a convenient storage space for your television, DVD player, and related electronic items. Whether you're trying to furnish your first apartment or simply want a new look for your current space, there are a variety of ways to purchase a cheap entertainment center that fits your needs. Shop around for the best price on the size and style that best meets your needs. 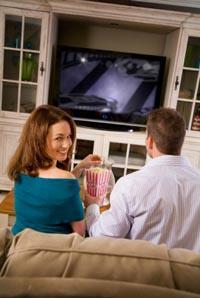 You can find cheap entertainment centers in a number of different places. Careful comparison shopping will help you choose the entertainment center best suited for your needs. It's also a good idea to scan the selection at your local furniture store. Even if you're on a tight budget, you can often find sale items and clearance merchandise. Some stores will also have deeply discounted floor models available for purchase, but you may have to ask if there's a backroom of specials or a clearance center associated with the retailer. If you live in a rural area, buying an entertainment center online might be the most practical choice, as long as you remember to factor the cost of shipping into your budget. If you're willing to be flexible about the size and style of your entertainment center, consider looking through the furniture offerings at local garage sales, consignment stores, and thrift shops. Websites such as eBay and craigslist can also be helpful resources for purchasing a secondhand entertainment center. If you have good carpentry skills, building an entertainment center may be the most cost-effective option. Designing your own custom model will also give you more control over the size and style of the piece-making it easier to match your cheap entertainment center to the rest of your home décor. There are many factors to consider before purchasing a cheap entertainment center. How much can you realistically afford to spend? What type of electronics do you need to store? Do you have a small television and a DVD player or a big screen TV, surround sound stereo system, and Xbox video game console? How much space do you have for your entertainment center? Do you have narrow doorways, tight staircases, or oddly placed electrical outlets that might cause a problem for the new unit? How would you describe your current decorating style? Do you prefer a modern and contemporary look or a more traditional form of home décor? Han you get your cheap entertainment center to your home without paying for delivery? If it needs to be assembled, can you complete this task by yourself? Entertainment centers can be made from a variety of materials. Solid wood entertainment centers will typically be much more expensive than entertainment centers made from particleboard, plywood, metal, or glass. Additionally, there are many entertainment center designs available for almost any room style and purpose. For example, a TV cart is a small, compact unit with wheels that works well in a home office or child's bedroom. A wall unit takes up a substantial amount of space, but built-in shelving can providing additional storage areas for books, picture frames, or collectibles. An armoire has doors that conceal the television when not it is not in use. A corner cabinet can be a great option for fitting an entertainment center into a small apartment. By taking the time to think about where you will use your entertainment center and how much space you have for it before making a purchase decision, you can make sure to choose the best option for your needs.